We went to the IHS conference in Houston more bullish on the ethylene cycle than consensus and we left feeling more comfortable with that view. Barring some sort of negative (geopolitically driven) demand shock we see capacity additions barely keeping pace with demand over the next two years and falling way behind thereafter. Other commodity chemicals are likely to be similarly impacted by lack of investment but ethylene/polyethylene is clearly the major driver. We remain positive on DOW, LYB and WLK, though WLK may be faced with very high ethylene purchase prices in 2017. The lack of capacity investment has two primary causes – feedstock and costs. Only the US offers any real feedstock advantage today – China coal is uneconomic at current crude oil prices and outside Iran the Middle East has run out of advantaged gas. Cost is the real problem in the US, with E&C companies either pushing construction costs up or missing estimates (of both cost and time) when the costs are reduced – this is slowing down the rate of project approval as one needs a higher ethylene margin to justify the higher costs or risk of higher costs. 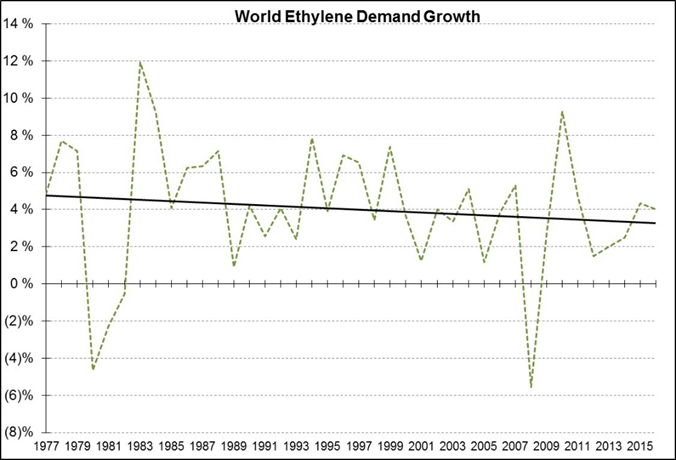 Ethylene surpluses following the expected capacity additions in the US in 2017/2018 could be more than offset by changes in demand and changes in production in other parts of the world, driven by feedstock changes, lower levels of polymer recycle and further shutdowns in production based on uneconomic China coal based routes. Near term – US ethylene could become quite tight in 2017 as derivative facilities start operation prior to the larger ethylene start-ups. There is a lot of upside in the US names if we move towards a cyclical peak and any weakness due to the uncertainty in 2017 about energy price moves or doubt over the impact of US additions should be seen as buying opportunities in our view. The significant potential in WLK is a driven by the expectation that trend returns can be achieved with the Axiall assets – we see high ethylene prices in 2017 as a risk. We have seen a significant turnaround at IHS (the leading consulting and market data provider in the chemical space) over the last few years and we were more impressed with the scope and analysis at this year’s conference than with any since IHS acquired CMAI (the then leading chemical industry provider of market data in chemicals) in 2010. To be fair, IHS has evolved through multiple acquisitions and changes of structure over the last few years and had suffered from distractions to their core business as a consequence. One good thing has not changed this year, and, in our view, many of our reasons to be concerned in the past have been rectified. The good thing is the annual conference in Houston – it still attracts the largest relevant crowd and remains a great place to meet people from the industry and get many perspectives from many parts of the world. What has improved dramatically is the work and presentations from IHS consultants/analysts themselves. This year bullish projections for profitability were, for the most part, comprehensively backed up and supported with concrete arguments. It is also encouraging to see IHS branch out into commodities that they have avoided in the past, such as fertilizers and TiO2. The ethylene story was particularly interesting, with the focus on just how little spare capacity will exist in the GLOBAL system even with the US start-ups this year and next, and how quickly that surplus could disappear if further Chinese cutbacks emerge – especially expensive coal/acetylene routes to EDC and ultimately PVC, and if more non-US crackers start consuming US surplus propane – lowering costs but at the same time limiting ethylene capacity, without capital investment to handle the higher overall level of gas in the separation process. Near-term, with CPChem confirming that it plans to start polyethylene well ahead of its ethylene plant, and with both Dow and Sasol/Ineos expected to start polyethylene this year, ethylene could get very tight and very expensive in the US through the balance of 2017 – this would be good for both Dow (see our recent research) and Lyondell – less good for Westlake given their large purchase need, but they could react by closing VCM capacity – tightening the caustic and PVC markets – which might help pricing in that commodity chain, resulting in higher overall profits. Polyethylene demand growth remains very strong – with Nova confirming that its recent start-up in Canada was sold out almost immediately and plenty of evidence that others are quickly pre-selling volume from plants that are expected to start this year and next. Economic growth is improving in 2017 over 2016 – almost everywhere – so base demand growth should improve also. This is all driven by geopolitics, with the right “anti-protectionist” policies likely to drive stronger growth in the US and elsewhere – US tax reform, US infrastructure, modified but still liberal trade agreements – the right moves could add as much as 1% to US GDP growth in 2017 and 2018. The bear case comes from protectionist policies, trade barriers and immigrant deportation. These will cause inflation, constrain growth and in IHS’s view possibly lead to a global recession. The border adjustment tax came under focused fire as a very damaging policy for the US and the world, with the few companies that would benefit overwhelmed by those who would not and everything overwhelmed either by inflation or a much stronger dollar (hurting exports) or both. We have yet to find a US corporate who thinks that the border adjustment tax makes any real sense. We share IHS’s views on the economy and its risk almost exactly – their most likely scenario has the border tax plan failing and never making it through the system and limited likelihood that a broad deportation plan has any chance of passing – so consequently they come down on the positive side of the base case (a base case that already calls for stronger growth than in 2016). The other relevant message from the conference was about China – continued risk to production through coal, based on the high cost and the environmental impact. Very strong continued demand growth driven by the consumer and a clear interest in revisiting building ethylene on the coast, integrated with refining, something which slowed dramatically in recent years as coal became competitive with crude. Overall the conference was very bullish for commodity chemicals – with clear indications that the rate of investment globally was not keeping pace with the rate of demand growth – across the board – not just for ethylene. Investments peak in 2017/2018 at a higher rate than demand growth, but drop off quickly thereafter. The 2019/2020 time frame is now close enough that any investment that would add to supply would be on someone’s books by now, and it is not there. While the focus of this report is ethylene, note that we like TSE, OLN, ASIX and HUN as well as CF because we think that all their relevant markets will get progressively better – though CF may have to wait another year for real urea strength. IHS discussed a peak in surplus ethylene capacity around the world in 2019 of around 1.6 million metric tons. 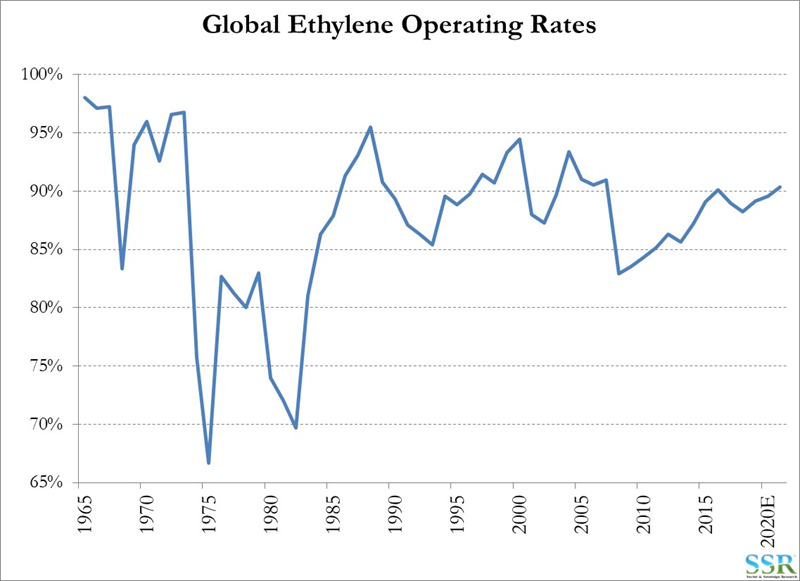 This assumes that ethylene facilities cannot operate at rates – in aggregate – higher than the levels seen in 2016 – the argument being that every region in the world was making good money in ethylene in 2016 and if you could have made more ethylene you would have. We might push back a little on this, as global operating rates have had much higher peaks in the past (Exhibit 2) and the world saw above trend plant shutdowns in 2016, but we also saw higher shutdown rates in 2015 and 2014 and there is an argument that this is the new “norm” – Exhibit 3. Plants are getting older – more work needed each time they close – more unexpected problems. Debottlenecked older facilities have far less space to move around in during turnarounds as land has been filled with extra furnaces, more pumping equipment and control systems. Regulations have increased – more stages of inspection before restart – this is unlikely to reverse in the US because these are all safety related. The labor pool is more limited when it comes to skilled turnaround contractors and in some cases replacement parts are taking longer to deliver than expected. Plants in turnaround are competing for labor with the large construction projects. Feedstock changes are in some cases limiting capacity – see later commentary. Regardless, the base case – as shown in Exhibit 2 – has only a slight dip in operating rates in 2018/19 and nothing like the declines that we have seen in prior industry margin lows. It is important to note that the significant historical dips have come from demand shocks – such as the financial crisis and were never projected in forward market views – these risks are no different today than they were in the early ’70s or 2006. The key point that IHS made – far more articulately than we have – is that 1.6 million tons of surplus capacity (assuming that 2016 represents a ceiling in realizable operating rates) is nothing in a 150 million ton market and there are a number of factors which could see this surplus disappear completely, before we even think about more positive changes in demand growth. Ethylene production around the world would only have to be reduced by 1%, or demand increased by 1% to eliminate the surplus completely. After 2018 we are not building to meet the rate of demand growth, and anything that is going to start before 2020 is in the planning and construction process already. The US is exporting increasing volumes of propane – in some cases as heating fuel but in large part as an attractive alternative to naphtha. The lower cost propane improves the economics of the facilities but in most cases, it reduces capacity unless the operator invests to deal with the changed gas flows throughout the plant. With propane feed there is more light gas coming out of the furnaces than with naphtha, and the gas separation processes cannot handle the load without lowering overall throughput. Companies can invest in more compression capacity and in means to handle the greater level of fuel gas produced, but if they do not they end up trading lower costs for lower ethylene produced. IHS had an estimate of as much as 1.5mt of lost ethylene capacity with increased propane feedstock – especially in Asia. While we do not have the data to support this claim, IHS had identified a further 1.5 million ton impact on the ethylene market from possible reduction in EDC/VCM manufacture in China directly from coal – through acetylene. Replacement EDC/VCM would have to come via a traditional ethylene route. 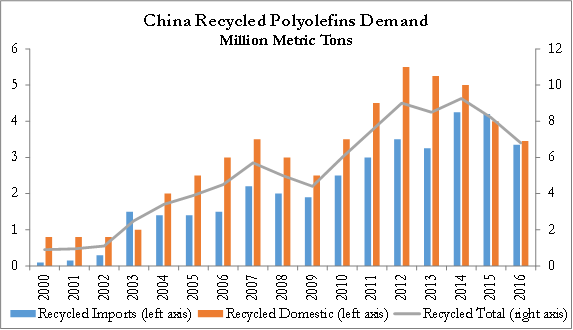 IHS showed a chart on recycled polyethylene use in China (reproduced here as Exhibit 4), which indicated a fall of more than 3 million tons of use since polyethylene pricing peaked in 2014. Recycling is always directly driven by economics and while the drop in use over the last few years will have been a positive for primary polyethylene demand this would reverse quickly if prices increase again. IHS was making the case that lower crude pricing will keep polyethylene pricing lower. We would argue that a tight ethylene market will push prices higher, regardless of the price of crude oil and that the recycling trend could reverse. It is however likely to have something of a balancing effect in a weaker polyethylene market and could offset the expected ethylene surplus in 2018/2019. Production outages are always unpredictable and there is always a possible range of outcomes in any given year. In the 2017-2019 period, we have the added issue of delays to start-ups of new facilities – although by now we have some clarity on the next few US units. As we have written in prior research, we would not be surprised to see Dow, Exxon and CPChem to take a series of planned shutdowns around the world once their new capacities in the US start-up, limiting the immediate effect of the new capacity. Both Dow and CPChem ae likely to have polyethylene up and running before ethylene this year so some of their ethylene growth in 2018 will take place in 2017 based on borrowed or purchased ethylene. We see this impacting the market in two ways – initially in 2017 companies are trying to build ethylene inventory in the US to accommodate polyethylene start-ups that are ahead of ethylene plants – consequently, when the new ethylene units come on line in the US at the end of this year we would expect US ethylene inventories to be at critically low levels, with a need for CPChem and Dow to pay back what they have borrowed and rebuild some inventory. The second inventory risk is the one that always causes markets to tighten more quickly than expected – it is also the reason why markets weaken more quickly than expected. If there is a widespread belief that ethylene availability may become restricted – buyers of ethylene derivatives will increase their levels of inventory to give them greater degrees of freedom in the event “just in time supply” becomes an issue. This is especially true of large importing countries – such as China for polyethylene or India for PVC. This inventory build can, and has in the past added several percentage points to apparent demand in any given year – adding 10 days of inventory to the chain increases apparent demand by 10/365 – 2.7%. In a 150 million ton ethylene market this is 4.1 million tons, 2.6x IHS’ identified surplus capacity. Inventory builds can also come from expected cost driven price increases and it is likely that with the crude oil move from $30-50 per barrel in 2016 we already have elevated inventory versus a year ago. The volatility shown in Exhibit 5 is not driven by the variability of pre-packed chicken purchases in any given year and is only slightly impacted by swings in consumer durable spending. The dominant cause of the swing is inventory moves from polyethylene producers through traders (in international markets) and some speculators, right through to the end user. The drop in the use of recycled polyethylene may explain some of the demand strength in 2015 and 2016, but this should continue to be a positive unless oil prices rise. Exhibit 6 shows polyethylene leverage by company based on the capacity we expect DOW and LYB to have in 2018 following the start-up of new facilities. As is always the case, the downside risks are macro and relate to either significant movements in energy prices or declining economic growth (often interconnected). A major step down in oil prices could do two things – cause an inventory reduction and flatten the cost curve – lowering apparent demand and reducing the US competitive advantage. A major rise in oil prices could result in economic weakness and increase the use of recycled polymer – dropping demand both from a macro perspective and from a substitution perspective. Economic weakness, whether driven by higher oil or a wave of protectionist policy, would also have a negative effect on demand in a two year period when capacity is being added, and could result in one of the larger steps down in operating rates that we have seen in the past and shown in Exhibit 2. In these weaker environments, the effect on profitability for the US companies will still likely be driven more by the shape of the cost curve than by demand and operating rates. A steep cost curve – high oil – low natural gas – will provide margin protection for US production and limit earnings declines for all companies. None of the group of LYB, WLK and DOW is discounting trough earnings today so all have downside in some sort of “shock”. In all three cases we believe that the risk/reward profile favors owning the stocks today.